We are finally packed and ready to leave in the morning to spend New Year in a private bothy high on a Welsh hillside. I am simply astounded at the amount of stuff that has been packed, it looks like we are going for a month rather than for a long weekend. It’s strange to think that if I was solo backpacking all my gear including tent and food would fit in a 42 litre rucksack, yet staying in a bothy there is a pile of bags in the living room piled high. If the track up is not driveable then we will be rather weighed down for the mile walk in. For some reason my non outdoorsy partner does not seem as excited about spending a few days in snow and sub zero temperatures as I am…………………………….. Collect wood from the forest, chop it, burn it and drink some beers, what more can you ask for? I have even dug out the ice axe in snowy anticipation. It was hovering around freezing inside the van when I awoke just before dawn. It was difficult to get myself out of my warm sleeping bag but a peep out of the window at clear blue skies helped my motivation. 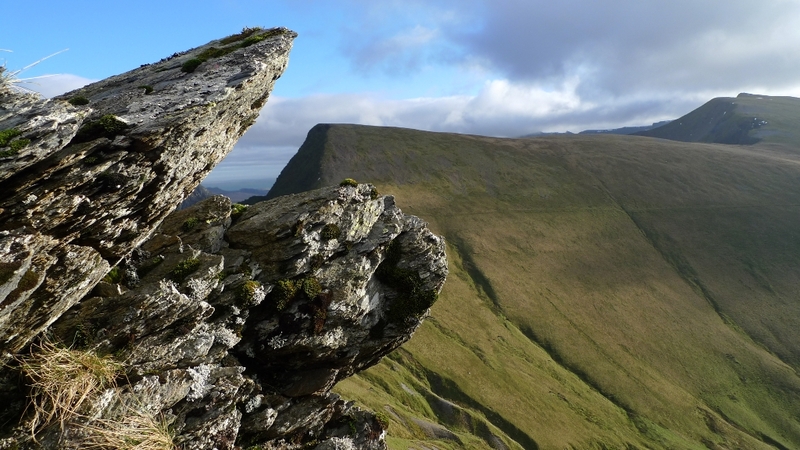 I was soon dressed in a down jacket and standing outside with a mug of coffee in my hands taking in the view from my lofty perch above Dinorwig. After breakfast, keen to get on the hills I drove down to Llanberis and looked for a place to park. I initially pulled into the village hall car park where I was willing to pay the £3 to leave a vehicle for the day, however the machine was refusing my money. A short drive away I found a small free spot just off of Victoria terrace underneath the mountain railway. A steep narrow road leads from Victoria Terrace to the beginning of the Llanberis path, a start that got me sweating in the cold still air. I was up and away early enough not to have to contend with crowds of people, the place was eerily deserted. The gate at the entrance to the path had a warning sign stating that the cafe at the summit of Snowdon was closed until March. My aim for today was not to head for the summit but to explore some of the quieter spots around the edge of the mountain. 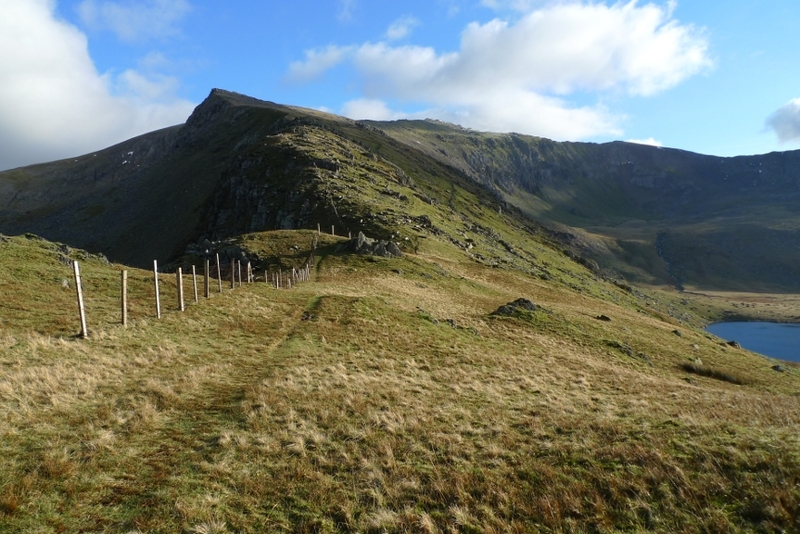 In just over a half a mile I left the wide path and ascended the easy grassy hillside to the left, aiming for the col between Derlwyn and the hillside above Clogwyn Mawr. 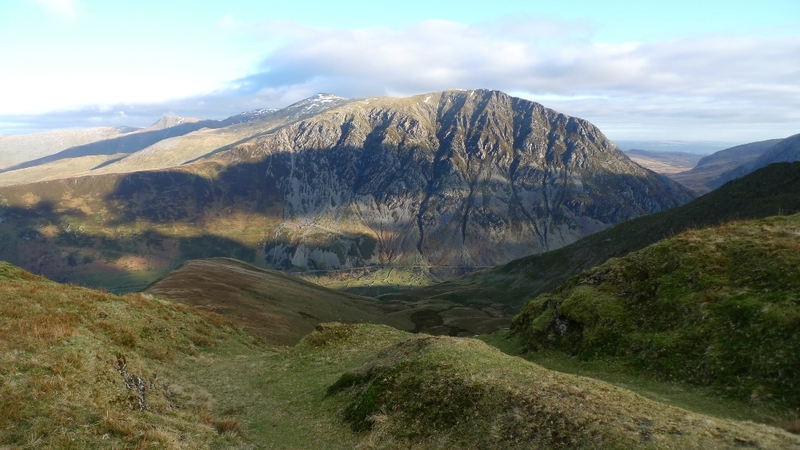 As I started the easy climb up the ridge a great panorama opened out before me taking in Llanberis and the Moel Eilio hills. The ridge continues towards the peak of Llechog taking in a few minor summits along the way including Tryfan which bares little resemblance to its more famous peak in the Glyders. Snowdon kept on drifting in and out of cloud and there was a dusting of snow on its summit. 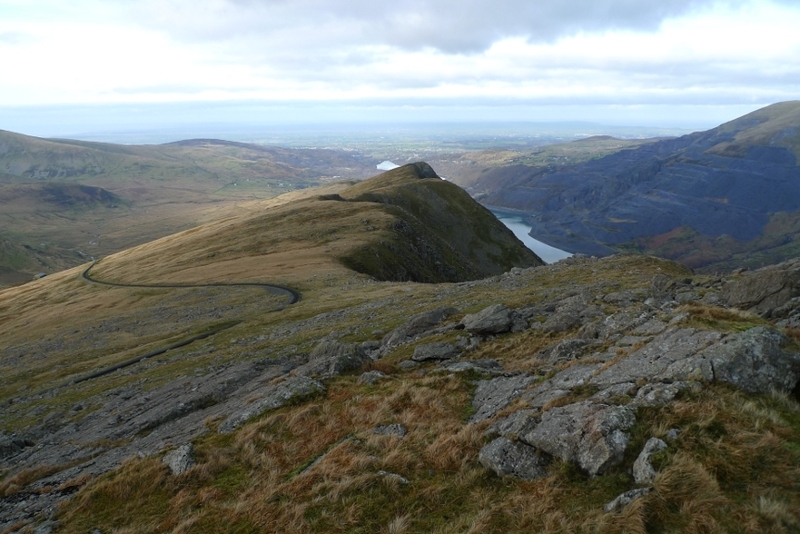 What surprised me was the fact that I was only a few metres from the very popular Llanberis path to the summit of Snowdon yet the ridge I was on was almost pathless. 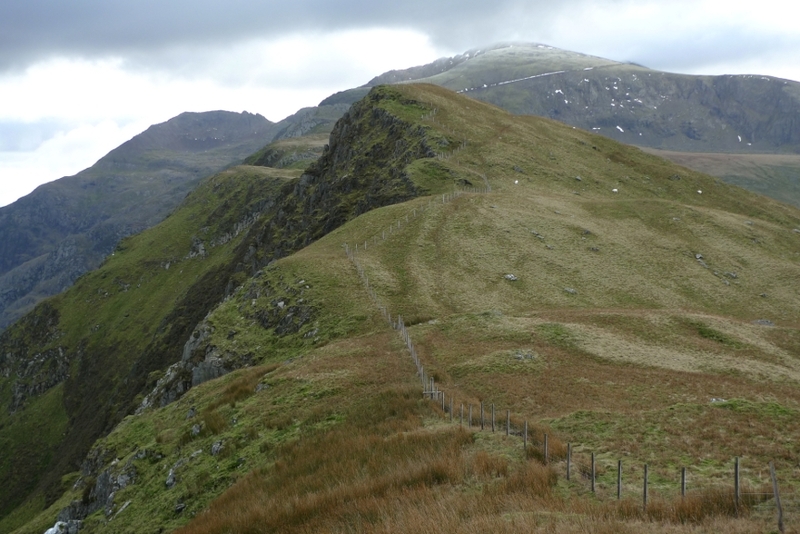 The views along the whole of the ridge are spectacular, especially to the left with a large drop down to Nant Peris and the road leading up to Pen-y-Pass. The summit of Llechog at 718m is a fine rocky perch and gave me the bonus of a tick on my list of Nuttall hills, the mountain railway can be seen snaking its way down to Llanberis. I picked my way down through large rocks and boulders to cross the railway line coming across a halt called ‘ Rocky valley’ and signs warning me not to leave the platform! 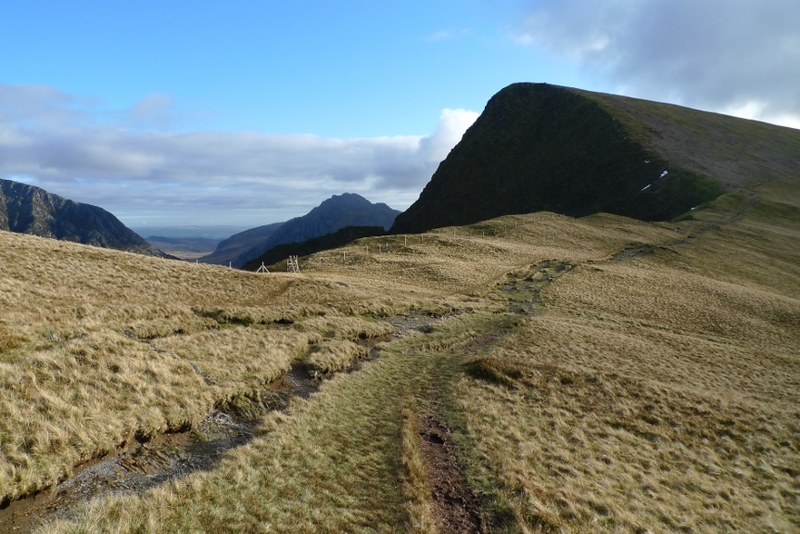 Easy grassy slopes then led down to the Llanberis path which was now busy with people making their way up Snowdon. 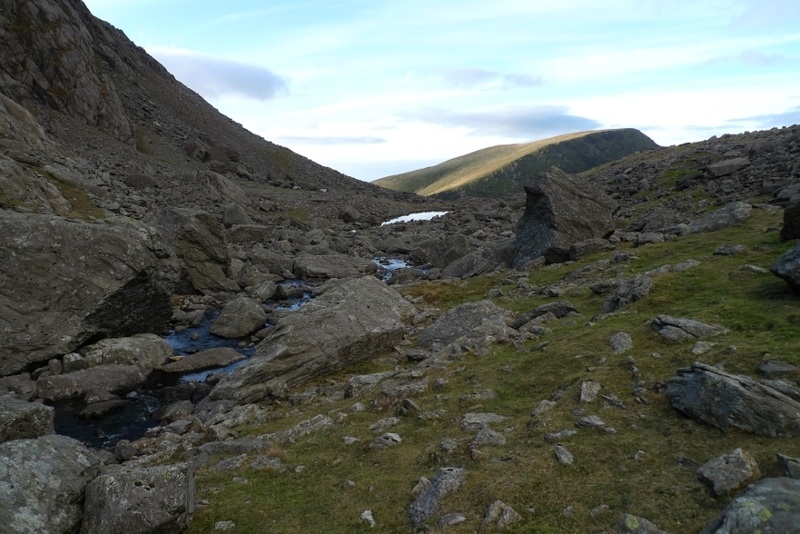 I quickly crossed the path and was once again on my own as a feint path was picked up leading to the Clogwyn cliffs. 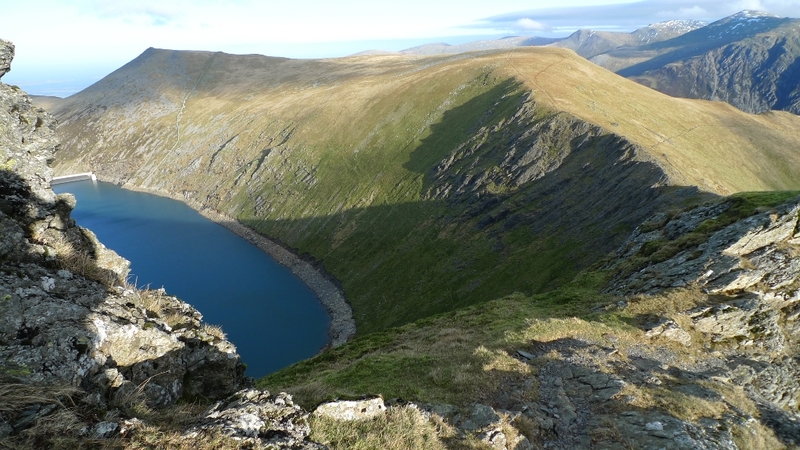 A broad flat plateau is crossed and suddenly Llyn Du’r Arddu comes into view. An absolutely stunning sight of this lake cradled in a rocky amphitheatre and dominated by the massive cliffs of Clogwyn Du’r Arddu. I wondered around in awe, carefully picking my way through the rocks to the shore of the lake. 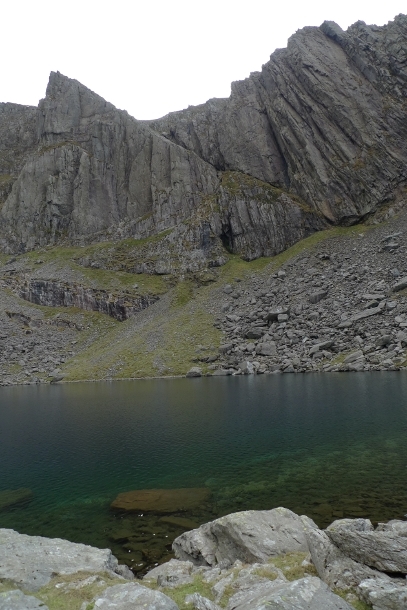 This amazing place was completely deserted yet only a few hundred metres away the crowds that were making their way up Snowdon. I sat on a large boulder for half hour or so to eat my lunch and drink a flask of coffee until the cold got into my bones and I had to move on. My plan was to try to contour across to Bwlch Cwm Brwynog, a task that on the ground is a little less straight forward than it looks on the map. Initially very rough ground is followed next to the outflow of the lake. 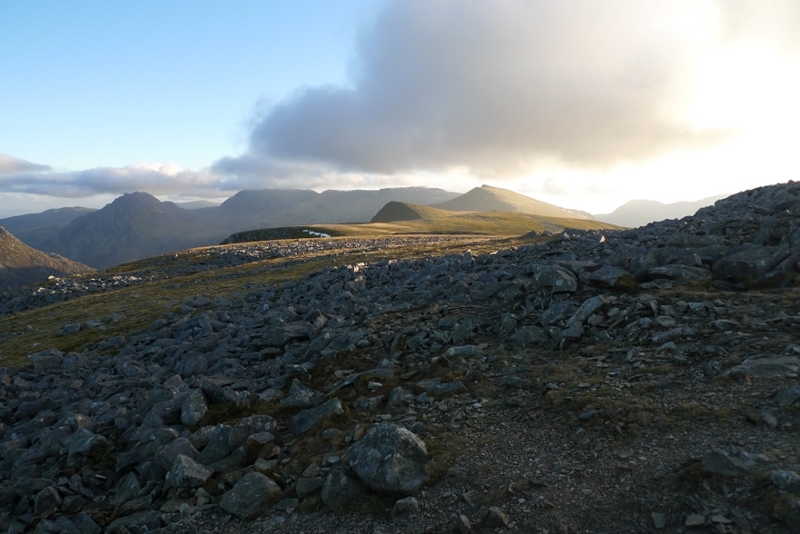 The views back to the cliffs were exceptionally wild, reminding me more of a Scottish Coire rather than a Welsh Cwm. 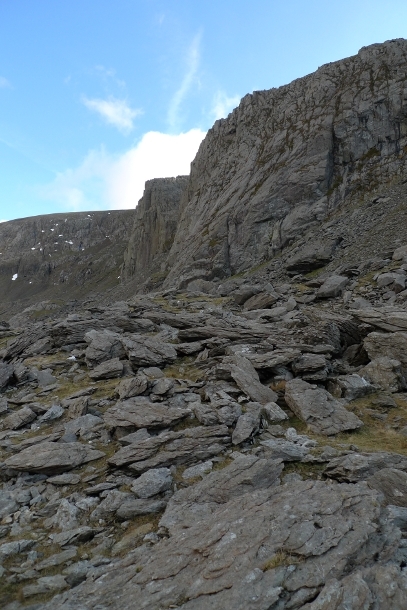 I tried my best to maintain height as much as possible as I made my way into the head of Cwm Brwnynog, although my contouring line ended at a band of cliffs. 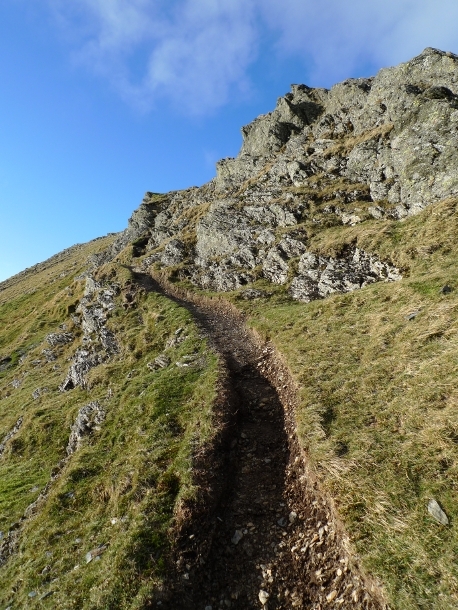 A steep descent led me to a path that I had missed in the rocky landscape and I was soon at the Bwlch. A fine spot with views up the Snowdon Ranger path and the summit. From here you can just make out the cafe / visitor centre at the top. 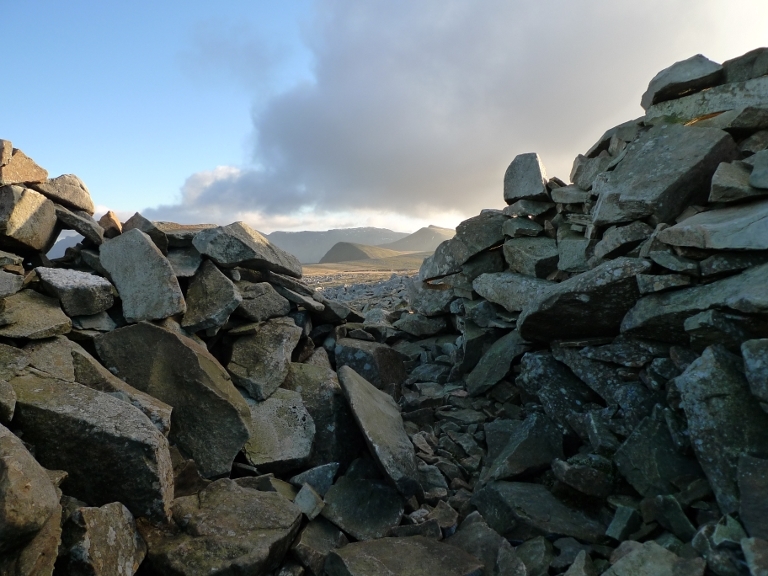 I turned my back and followed the narrow path to the summit of Moel Cynghorion. Again so close to Snowdon yet deserted. It had only just gone past 2.00pm yet the light was already starting to dim a little when the low sun disappeared behind a cloud. 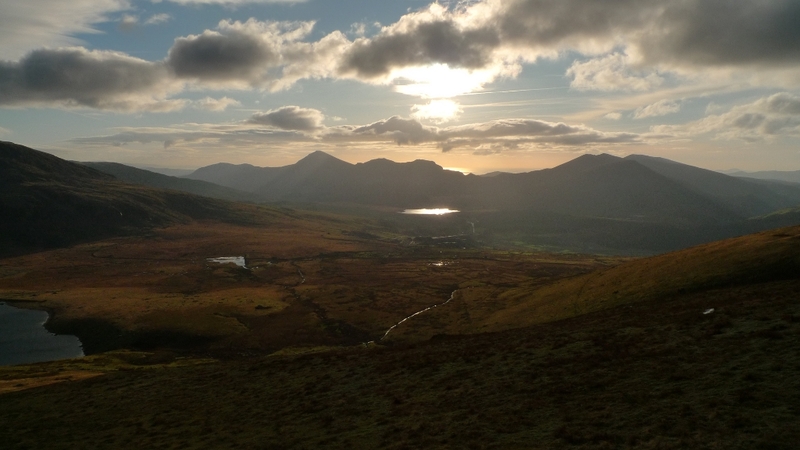 It is a fine walk along the ridge of Moel Cynghorion to Bwlch Maesgwm, the sort that enables you to stride out with hands in pockets yet offering views in all directions. A runner headed up Foel Goch at such a speed as to make me feel a little giddy, maybe just maybe I could be that fit one day? 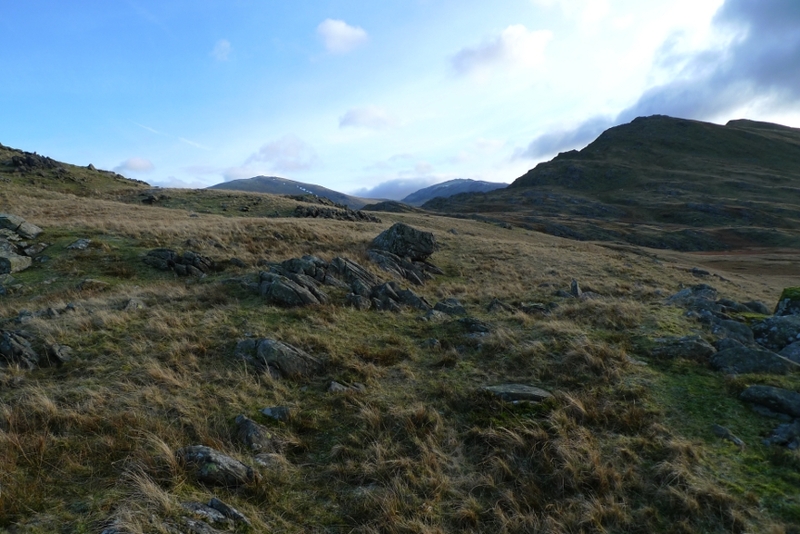 The bridleway back down to Llanberis is well graded and easy to walk on, the sort that I like to seek out when backpacking. I was soon back at the van reluctant to have to drive back home. Already I was eager for another weekend in the mountains. ………I woke up in my room in Sri Lanka with a bad cold which had kept me in bed the day before. Corrina headed into the guest house to get us some coffee and breakfast whilst I lay in bed, looking at the mountain view out of the window. She was back half an hour later with breakfast and looking a little bit worried. She said that the hotel owners were talking about a wave that had taken away the town of Galle which was about 30 minutes away, they were asking her what this could be. She was a bit confused about what they were talking about but could tell from their faces that something serious had happened. Later that day the guest house owners put on the television and all I can say is that we were horrified at what we saw, the screen was full of images that would never be allowed to be shown on the news at home. To this day we still count our blessings for a decision that perhaps saved our lives, that decision centred around the fact that we are both a little bit tight with money. We had planned to spend the Christmas week at a small backpackers beach near the southern town of Galle where we would meet Corrinas mother on New Years Eve. We were slowly making our way there through the mountains, when a couple of days before Christmas we decided that it would be nice to meet her in the Mountain town of Ella instead. This would cut down our costs as we could then share her taxi down to the coast. We later found out that the beach where we were originally headed was completely devastated with the wave destroying houses half a mile inland. The guest house owner was starting to panic as he could not get in contact with family down on the coast. Over the following couple of weeks that we remained in the country most Sri Lankans that we met had lost at least one family member that day. That for us was the most upsetting thing, seeing how the Tsunami completely tore apart a country. We stayed for over a week with our gracious hosts in Hapitale as there was nowhere else for us to go, flights in and out of the country were cancelled and there were warnings of disease spreading. Although they had lost family members that day, they looked after us well. Our thoughts still turn to people we had met and travelled with prior to the Tsunami in Sri Lanka, especially the couple we shared a taxi and then a guest house for a few days. They were heading to the coast for Christmas and we never heard from them again. One day we will return to Sri Lanka as it is a fantastic country, it would be great to think about it with a smile on our faces rather than with a lump in our throats. My thoughts today are with the 250,000 who lost their lives that boxing day. Our hosts for that week. A quick happy Christmas before I slope off to bed, hope that you have been good this year and Santa brings you lots of new toys! After what seemed like months of rain the second weekend of December promised a spell of calm, sunny and cold weather. 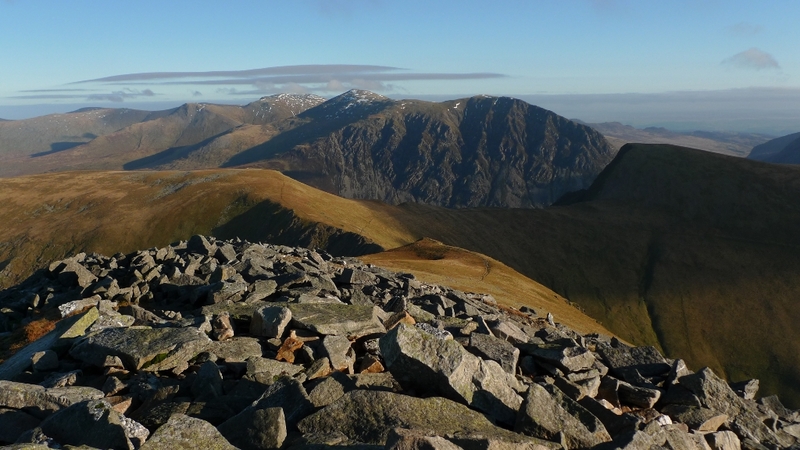 The perfect weekend for a short winter backpack with a wild camp on the hills. 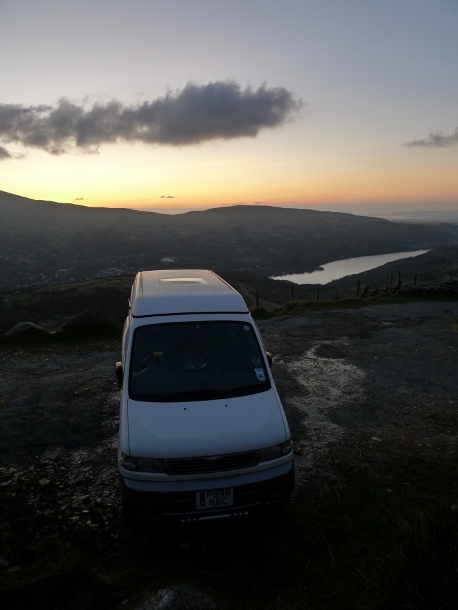 However I was still feeling a little under the weather so decided to head to Snowdonia and ‘wild’ camp in the Bongo. This would mean having a much lighter pack and more comfort in the van to while away those long winter nights. The weekend started with the usual friday night motorway horror and it was late when I pulled up at the isolated spot of Llyn Geirionydd with its picnic site and public loos. Almost as soon as I parked up frost started to form on the van, it was going to be a cold night. A couple of vehicles did a circuit of the car park at around midnight and parked up, making me a little anxious for a while. However they did not disturb me and they were gone when I woke up in the morning, surely a little bit cold for a ‘romantic’ meet?! I parked the van at the end of the public road by the locked gates just before the track to Marchlyn Mawr reservoir. The well signed cctv camera made me feel a little more comfortable leaving the van for the day at this scruffy litter strewn spot. What exactly this isolated camera is meant to be looking out for is anyones guess, probably to do with the ‘electric mountain‘. A metalled road leads all of the way to Marchlyn Mawr reservoir but I took a left just before Marchlyn Bach on another surfaced road. As soon as I had left the van I was in a wind tunnel making it difficult to keep a good momentum going. The cold air making it difficult to breath and paralysing my face into a grimace. 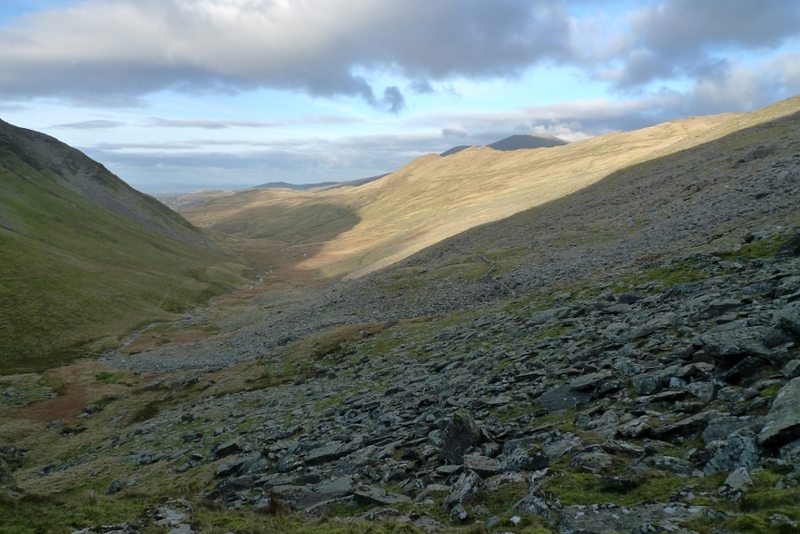 I left the track after a couple of hundred metres and ascended the northern ridge of Elidir Fach. A combination of cold and low sun meant that I ended up wearing a hat with a baseball cap on top, with my Paramo hood tightly done up over that. I was still cold and half blinded. 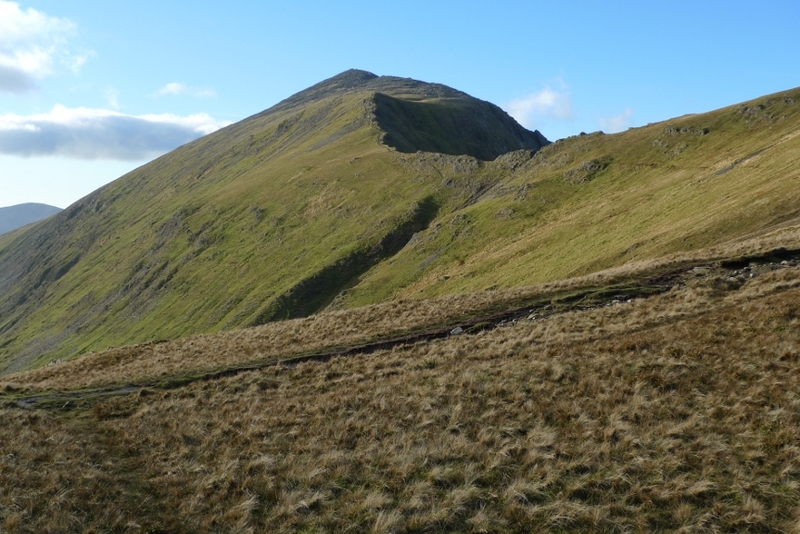 A scantily dressed runner made me feel unfit and overdressed as I reached the col beneath Elidir Fawr and started the steep climb up to the ridge. A freshening blast greeted me as the ridge was crested and I had to take a great deal of care on the icy rocks as I made my way to the final summit cone. The summit shelter of Elidir Fawr gives extensive views in all directions and I stopped to chat for a while with a couple of blokes whilst photos were taken. An obvious ridge leads eastwards with small outcrops but no difficulties with the cliffs of Pen-yr Ole Wen dominating the view ahead. To the left is Marchlyn Mawr reservoir with its dam and tide mark spoiling the wild scenery. Suddenly out of the wind I found myself in an oasis of calm with the wind vanishing. I took the opportunity for a nice long sit down to eat my lunch and drink a flask of coffee. The warmth of the sun thawing out my frozen face, half an hour of bliss simply sitting and being in the mountains. 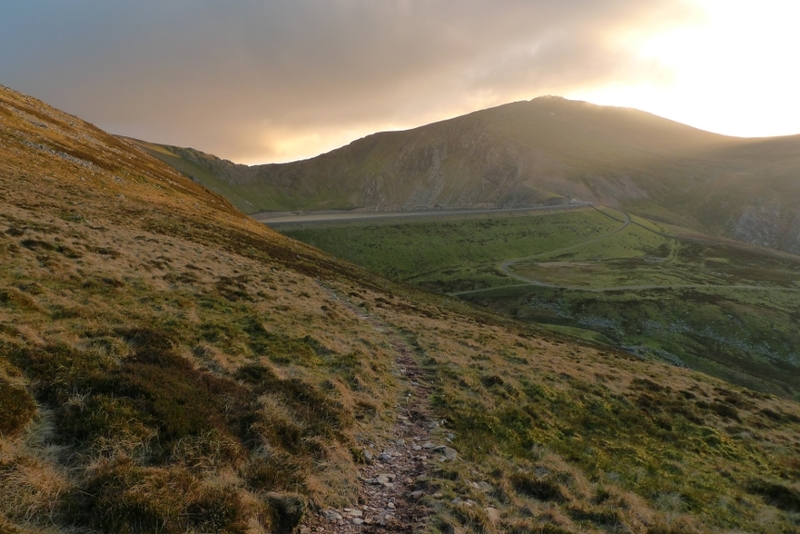 A path contours to the south of Mynydd Perfedd and leads to the col beneath the steep slopes of Foel- goch. From here Pen-yr Ole Wen really dominates the scene. 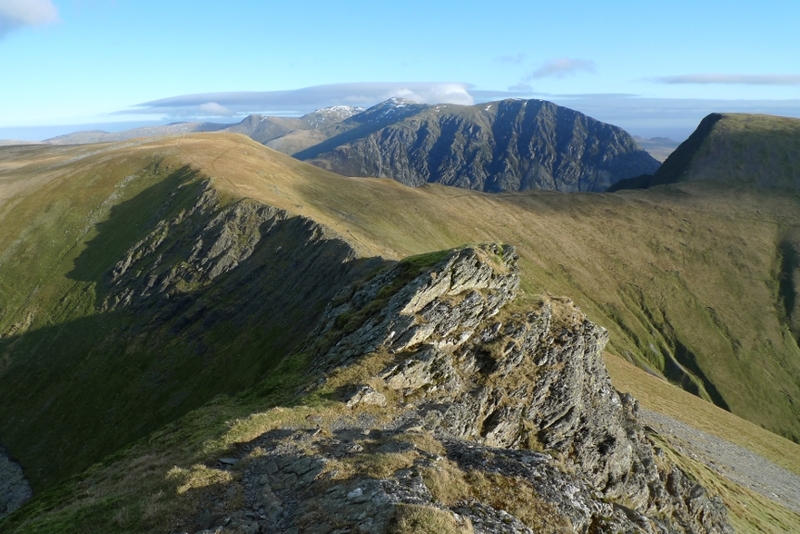 With views back along the ridge leading up to Elidir Fawr. Foel-goch summit is quickly reached with strong winds blowing over the lip of the huge drop into the valley below. 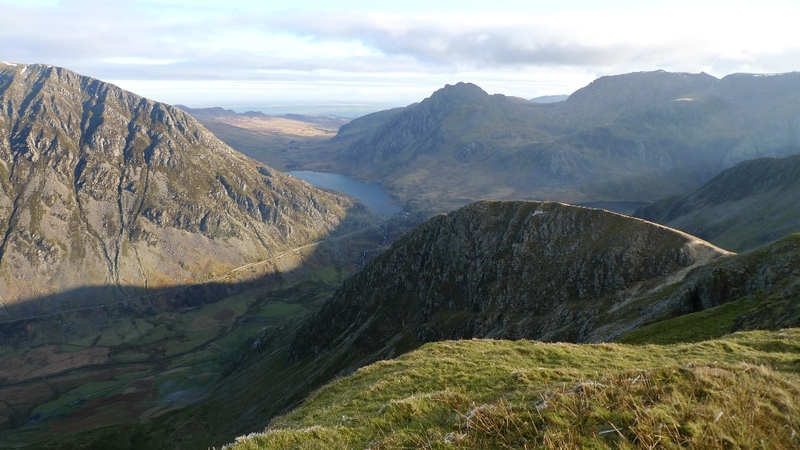 From here there is a great view down the length of the Ogwen valley, with mighty Tryfan being dwarfed by the surrounding peaks. 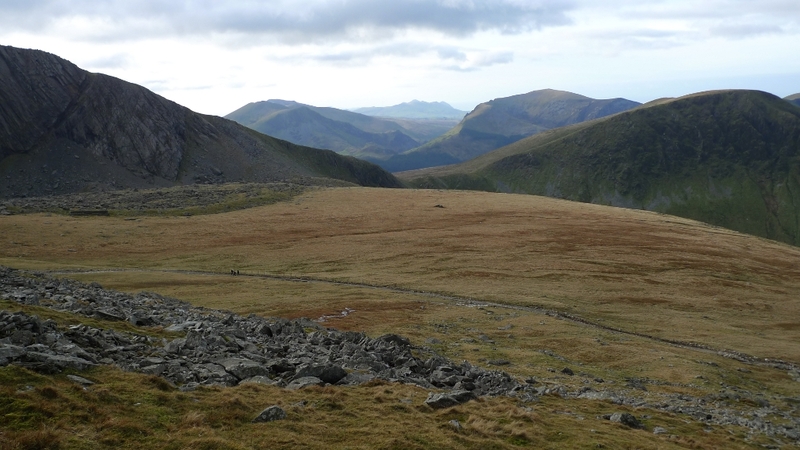 Wanting to save my knees I continued along the ridge towards Y Garn before contouring easy grassy slopes before ascending Mynydd Perfedd and then Carnedd y Filliast. Again I sat for a while in the shelter and watched the clouds build first over Glyder Fawr and then over the Carneddau. 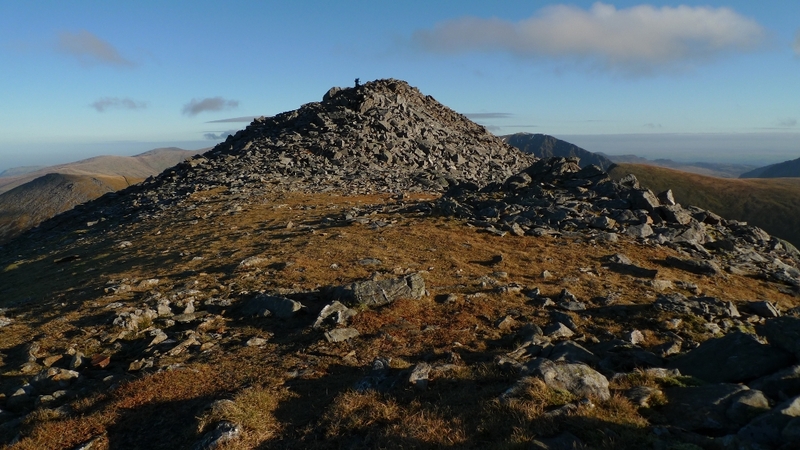 A quick look back at the Glyders was followed by a steep rocky descent to the final summit of the ridge, which is unnamed at 721m on the map but a hill that gets a tick on my Nuttall bagging! A feint path leads down to the access road to the reservoir from where it is an easy stroll back to the locked gate at the end of the road. 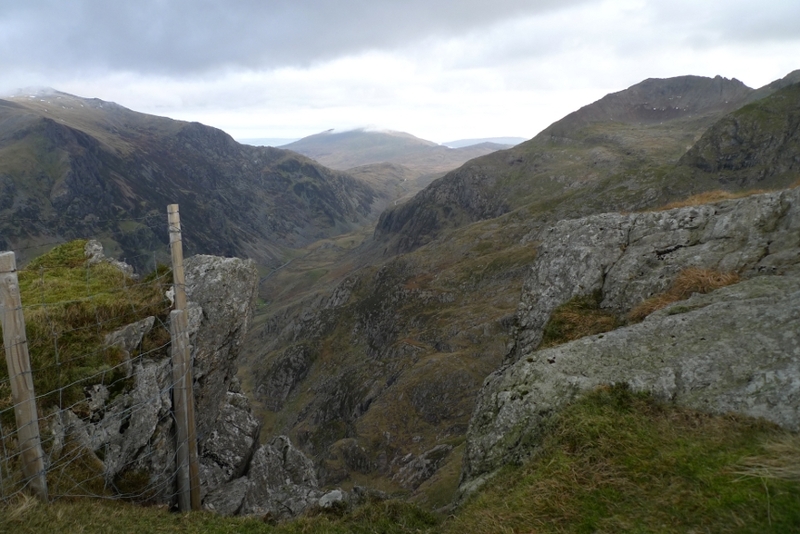 I had identified a small pull in for the van high above the village of Dinorwig, next to the giant slate quarries. The sun was setting as I arrived and I got a brew on whilst I watched darkness slowly slip over the surrounding hills. From my 430 metre perch I sat and watched the street lights come on far below before the chill in the air sent me to seek shelter and a warm sleeping bag inside the van.